Description: A MorphOS port of Snes9x 1.43, with overlay and joypad support by Fabien Coeurjoly. 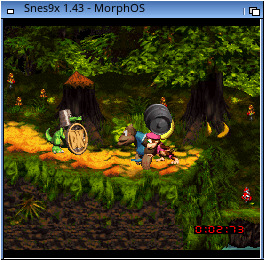 This is a MorphOS port of Snes9x 1.43, with overlay and joypad support. is especially useful on Powerbook where only the native resolution is supported. This change was made *years* old, but somehow it never made it on my site.